Small heading dies are required in order to manufacture minimum screws often used in digital cameras, personal computers, video game consoles, and other electronic devices. 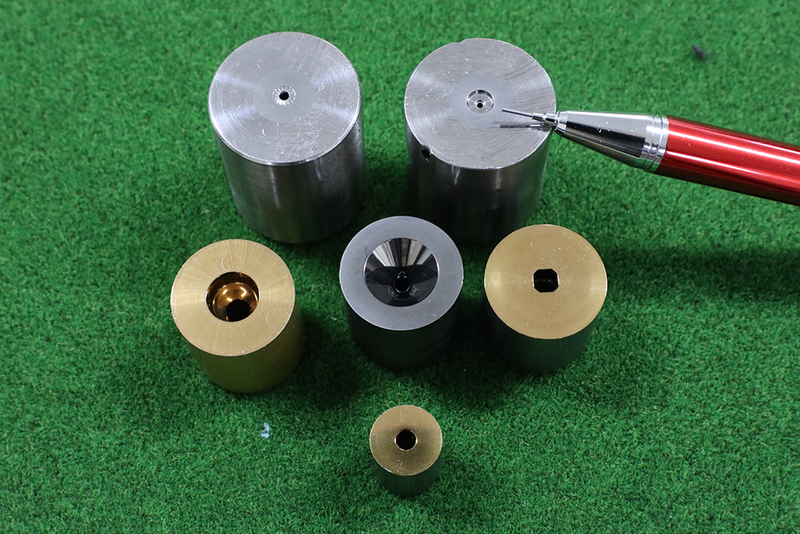 We specialize in heading dies with a diameter of φ0.4-φ10mm. One element that affects the lifespan of dies is polishing inside the hole. It is said in general that machining is difficult because polishing and lapping tools that are used become smaller as the diameter of the hole becomes smaller, and polishing defects are likely to occur due to insufficient strength of the tool. Therefore, in many cases, processing is done by hand. Needless to say, tools for polishing extremely small holes are not commercially available, so our craftsmen make them from scratch, according to the size and shape of the holes. We have committed to carbide with small diameters for a long period of time, cultivating the polishing technology for these holes. The polishing process is delicately balanced with the shape processing before the polishing. Our craftsmen finish each of them by hand according to the manufacturing process for each client. We value all of our important clients’ manufacturing progress and produce our dies as an essential tool to make our clients’ project come to life. We also manufacture heading dies for forging small metal parts used in various fields along with screws. High strength and toughness can be obtained by forging, so you can securely use them — even the tiniest parts. Complicated shaped holes such as square and hexagonal holes can be processed to match the required part shape, as well as round holes. Even with complicated shaped holes, our polishing process will be done in the same way as the small diameter round holes. From designing to manufacturing — we will commit ourselves to meet your needs.